Why we're supporting Typed Clojure, and you should too! tl;dr Typed Clojure is an important step for not just Clojure, but all dynamic languages. CircleCI is supporting it, and you should too. Typed Clojure is one of the biggest advancements to dynamic programming languages in the last few decades. It shows that you can have the amazing flexibility of a dynamic language, while providing lightweight, optional typing. Most importantly, this can make your team more productive, and it’s ready to use in production. This isn’t typing as you expect from the Java world. Typed Clojure is much much more powerful than that. Most Clojure code, like other scripting languages, is about manipulating hashes and lists. Typed Clojure allows you type-check duck-typed languages. Typed Clojure is based on important advancements in combining typed and untyped languages. Based on Typed Racket, it further proves that optional (or gradual) typing is practical to use in production code. many other properties about set, lists, vectors, and object instances. Not only that, but because it’s optional, adding type-checking can be done incrementally, providing only value where you need it. You can annotate a single library, a single namespace, or a small set of functions, and you can use libraries that aren’t typed. Oh yes! CircleCI has been using it in production for 3 months. We started by using it in areas that are hard to test, such as code which allocates AWS machines and VMs. 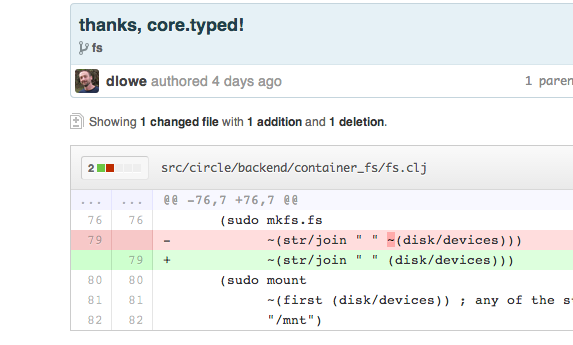 That’s right, we’re type-checking devops! We now using it in 45 namespaces, about 20% of our codebase. Those are covered using only 300 type annotations. And obviously, this has made us more productive, by finding bugs before we ship them. We’ll go into using more detail in a later blog post, but obviously we’re very excited. We’ve supported him, and you should too!